Here’s how it scores against the Wearebodybeautiful.com scoring criteria. The flashes last 10+ years of monthly use so you’ll enjoy silky smoothness for ages. Not very pretty, more functional that feels top quality. It’s very easy to use. I love it for facial use because it’s cordless and the flashing action works well. It’s also brightens your skin for a radiant complexion. With the largest 5.4 cm2 body flash window, it’s quick to cover a full leg – in around 10 minutes. One of the best! Good pre- and post-sales information with access to the user manual. Support is via telephone, email and online chat. With a 2-year warranty. Lots of very positive reviews and love. Budget range: ££ Offers on the RRP are common so you can pick this up for under £200. Super value and a great gift for someone special. The Panasonic ES-WH90 uses Intense Pulsed Light (IPL) to slow and reduce your hair growth rate. It’s safe for use at home on light to dark skin tones and dark hair. Continued use eventually stops your hair growth and periodic maintenance sessions keep your skin silky smooth. 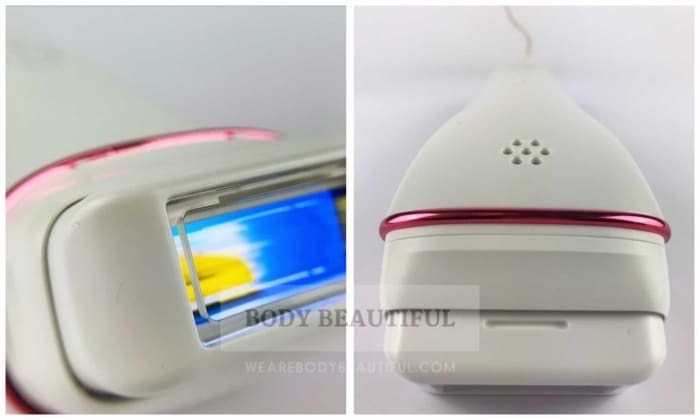 Use the ES-WH90 on body and face. 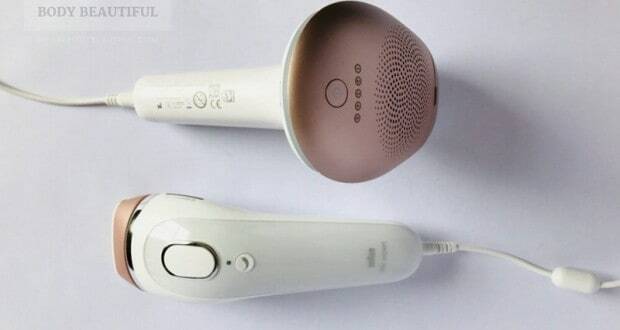 Manufactured in Japan by Panasonic Corporation, this is Panasonic’s offering to the home IPL hair removal market. I like the strong reputation of this trusted, household electronic brand. Available in the UK and Europe, it’s CE certified to meet EU safety standards and it’s clinically proven. It’s not yet FDA-cleared. It’s also designed and proven effective to use around your face to even and brighten your skin tone for radiant skin. Learn more in the review below. For legs and arms, you start with 5 treatments at 2-week intervals (taking 8 weeks), then continue monthly until you get your desired results. For underarms face and bikini line you use it weekly for 2 months, then reduce to every 2 weeks. Stay hair-free with periodic top-up treatments as you need them. You may need these less often over time. I particularly like the Panasonic ES-WH90 for IPL facial hair removal. That’s because the design especially suits these treatments. The long shape makes it easy to see what you’re doing and the facial attachment is effortless to get a flash and great coverage. It’s also a skin rejuvenation beauty tool too. Use it every 3 days on your face. It brightens and evens your skin tone. Love this, and the great value price! The Panasonic ES-Wh90 is solid and well-made, and it feels great. Although it lacks the style and beauty of other devices it makes up for it with a functional and easy to use operation. I particularly like it for facial use because of the attractive low price, and it’s effortless to get great coverage with the facial attachment. 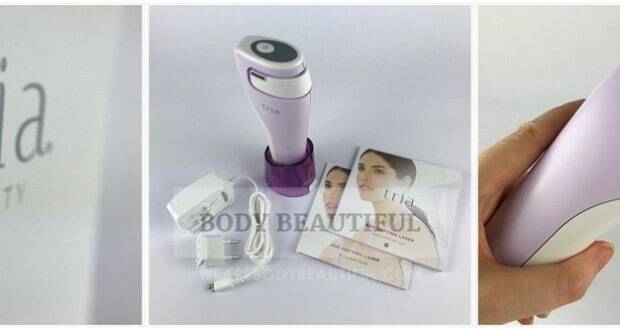 It’s cordless too so extra convenient and it doubles as a beauty device to even your complexion for radiant skin. Super value for under £200. Or keep reading my full review to understand why it’s the best for facial use. What’s IPL facial skin rejuvenation? What is IPL facial skin rejuvenation? I love being in the sun, but I know the damage it does to your skin. It causes premature wrinkles, pigmented spots like large freckles, enlarged pores and uneven weird textures. Some face creams help with the effects, but you need a little extra help to get back that youthful glow. And this is where IPL can help. IPL is not just well-known for hair reduction. It’s also known to enhance skin tone and reduce areas of pigmentation. It’s a popular beauty clinic treatment because it reverses the effects of ageing sun damage giving you a fresh and youthful complexion. 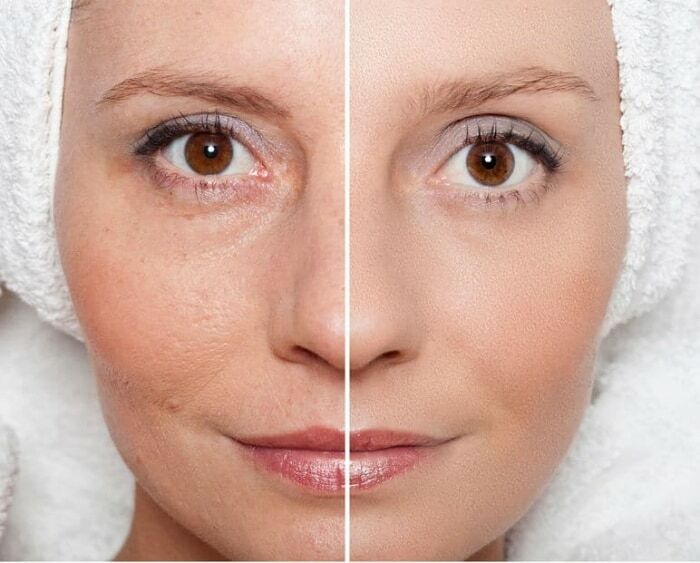 Although IPL skin rejuvenation helps with fine lines, it’s not for drastically reducing wrinkles. Professional IPL skin rejuvenation is also known as the photofacial. It works by the same principle as with hair removal. The IPL targets the dark pigment in your skin. For hair removal, this is the melanin in your hair. For facial rejuvenation it’s redness and the darker pigmented patches in your skin. So, for me that means weird, splodge-like freckles, red patches, uneven skin tone and small red spider veins. Lush. The IPL breaks down these pigmented areas and your skin diffuses them. So, they fade over time, revealing a more even complexion. For illustrative purpose only: to explain the possible results for professional IPL skin rejuvenation treatments…On this left this stock photo shows skin with uneven colour, large pores and textures associated with ageing and sun damage. On the right, the (probably airbrushed) photo shows glowing, brighter skin with a smooth, fine texture and even tone. The IPL energy also stimulates your skin. It causes small injuries deep in your skin. To heal this, your skin triggers the production of collagen and new cells. The collagen smooths and plumps your skin. It softens the appearance of pores and irregular textures so shedding the old dull skin reveals new, fresh skin that’s more finely textured and glows. How many treatments and cost? Professionals recommend a course of 3 to 6 sessions on your treatment area at one-month intervals. And then at least one maintenance treatment each year. Sessions cost from around £150. And although bearable, they smart a bit and cause angry red skin afterwards! Common body areas to treat are the face, neck, chest and backs of hands. So, is the Panasonic ES-Wh90 the same? So, what does the ES-WH90 do? Panasonic say using the ES-WH90 with the facial attachment on your face every 3 days for 2 months gives ‘fine, smooth skin that glows’. 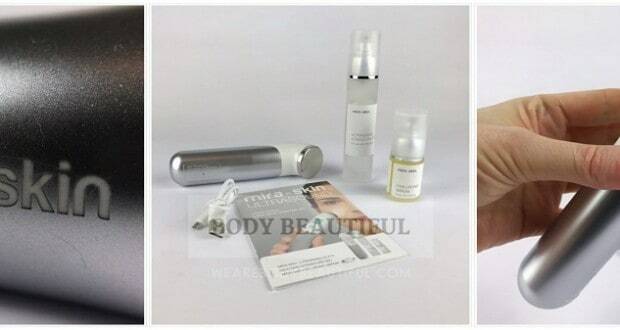 They explain it encourages your skin to shed the dead cells revealing the fresh, glowing skin beneath. It sounds similar, but it’s different to professional treatments. That’s because the IPL is much less powerful making it safe for use at home. Reduced power IPL means you’ll need more treatments and more often to see results. The recommended schedule is every 3 days. So, the effects are slower and build up over time. I’m interested to see my results. And unlike professional treatments there’s no discomfort during treatment when used on the settings safe for your skin tone. They also make no claim the results will eventually match those of professional IPL rejuvenation treatments. There are no ‘before and after’ photos. You need to use it every 3 days for 8 weeks to see results, but they also don’t say how long these results last. I guess you have to keep going. Their web page notes a study with 32 Caucasian women into the facial brightening effects of the ES-WH90. 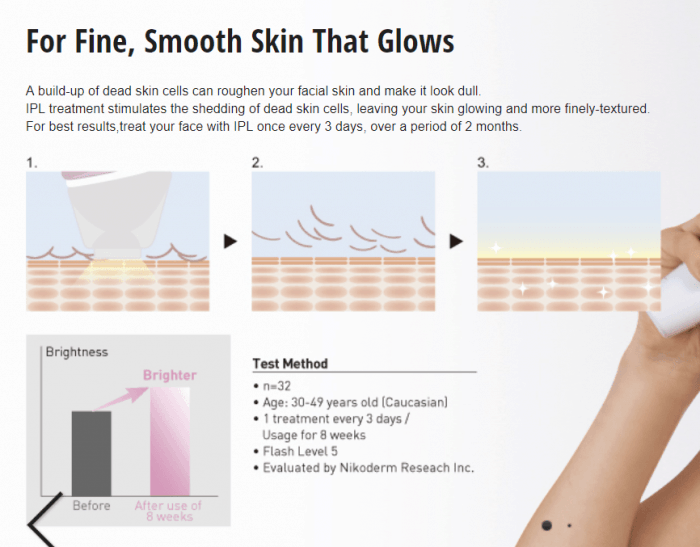 They illustrate the results with a simplified bar chart showing facial skin is brighter after 8 weeks of use. But there’s no real data and they don’t share the full study. I want to see it. I can’t find it. 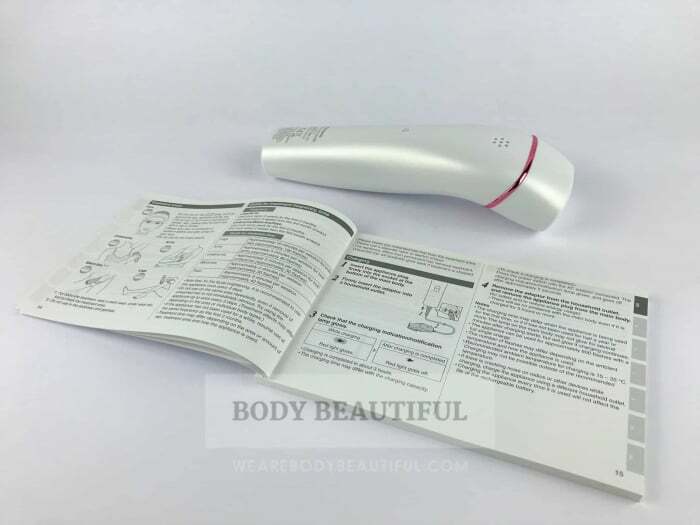 A section of Panasonic’s ES-WH90 product page: Panasonic use simplified diagrams to explain the IPL effects of giving ‘fine, smooth skin that glows’. Three numbered illustrations show the skin shedding process revealing glowing skin beneath. A bar chart illustrates the subjects of the 32 strong test had brighter skin after 8 weeks of use, but there’s no real data or numbers shared. I’ve asked Panasonic customer support for the study. I’m still waiting. With a bit more information and access to results of a positive study, I’d get very excited about this device. 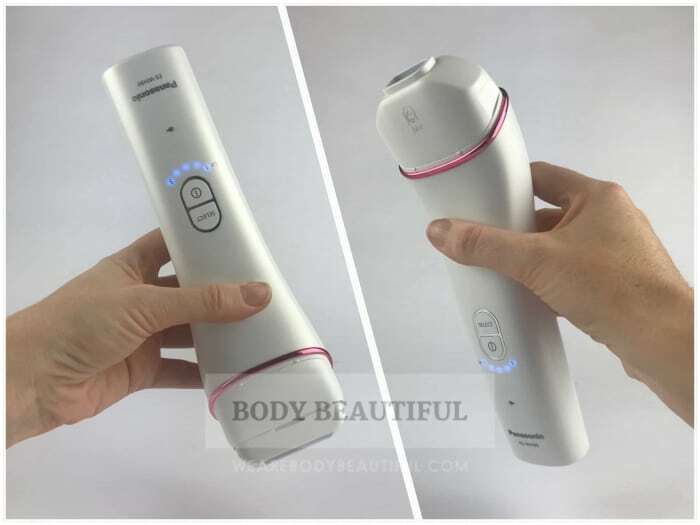 I love the idea of the dual benefits of the Panasonic ES-WH90 for hair removal and fresh, glowing skin. For now, I’ll trust in the Panasonic brand whilst our test continues. It’s an attractive added extra because it’s still a fab choice for facial hair removal. Keep reading to learn more. 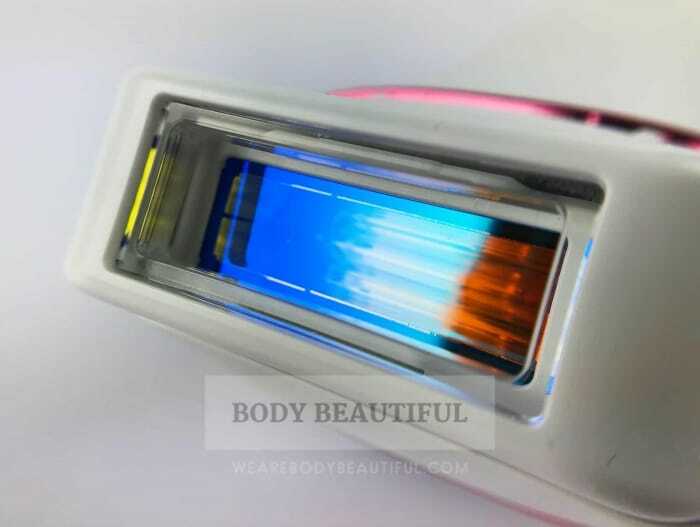 DON’T use facial and chemical peels whilst using the ES-WH90 for skin rejuvenation. It makes your skin more sensitive to the IPL and can cause side effects. Use a sunscreen minimum SPF 30 during the course of treatment. Your skin is more sensitive to the sun after IPL and it also protects your skin from further sun damage. Don’t expect a miracle! As with IPL hair removal, results will vary by user and can be subtle. 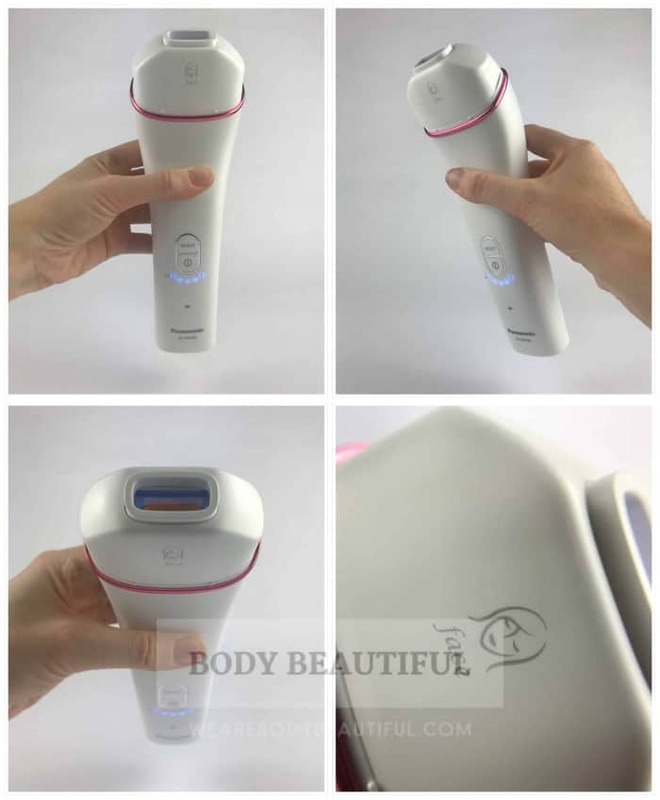 The ES-WH90 is excellent value and scores 5 stars for both full body treatments or just facial use. It has a massive body flash window that’s 5.4 cm2 big. That’s the biggest of all the devices I’ve reviewed. And the bulb lifetime depends on the intensity level you use. 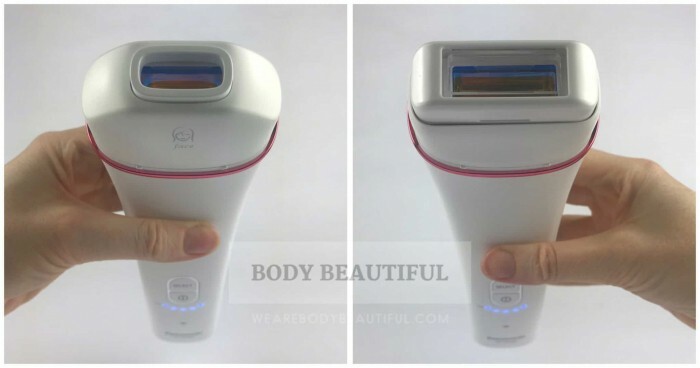 The Panasonic ES-WH90 has a huge body flash window/ It’s 5.4cm2 – the largest of all the home IPL hair removal devices I’ve reviewed. This means each flash covers more of your skin surface area. It’s not too big for treating smaller areas too – keep reading to learn more. You get 200,000 flashes if used on intensity level 3. With the 5.4 cm2 body attachment that means you can treat a total body area of 1,080,000 cm2. That’s huge and equates to 200+ full body treatments (full legs, bikini line, underarms and face). That’s 15+ years of monthly use after the start-up phase. Loads more than you’ll ever need. 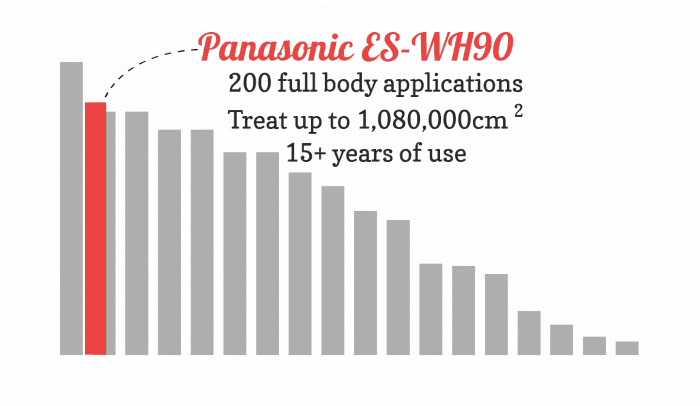 This chart shows how long the Panasonic ES-WH90 lasts compared to other devices. The value is fantastic. The bulb life means you can cover a total body area of 1,080,000 cm² on intensity level 3. That’s enough for over 200 full body treatments lasting over 15 years of monthly maintenance top-ups. It’s one of the best. On level 5 you can cover a total body area of 540,000 cm². That’s the same as over 10 years of monthly full body treatments. 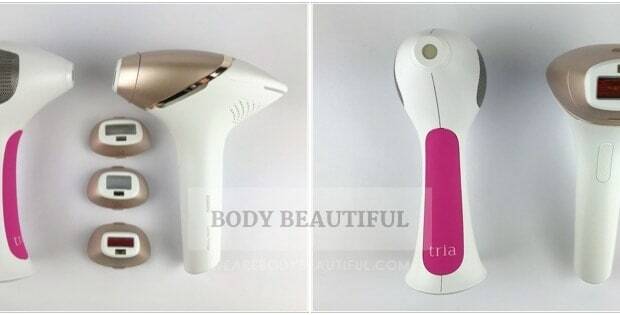 It’s an excellent value choice for both full body, small areas and facial IPL hair removal treatments. If you use it on the highest level 5 you get around 100,000 flashes. This still treats a large total body area of 540,000 cm2. That’s equal to 135 full body treatments lasting 10 years of monthly treatments. It’s excellent value. And the design of the body attachment means it works well on trickier areas too, like your knees and bikini line. Other devices give a smaller precision attachment for these areas, but I don’t think it’s necessary with the ES-WH90. I especially recommend the Panasonic for facial treatments. 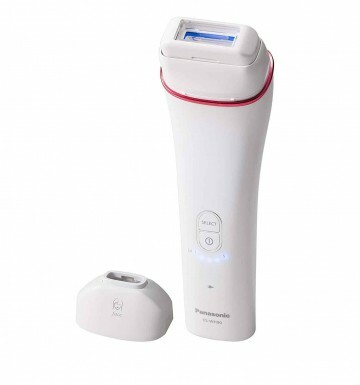 It’s fantastic value for long-lasting hair removal on your face. The facial attachment is 2.4 cm2 small so it perfectly fits your upper lip area. So, using it on intensity level 5 with 100,000 flashes, you can treat a total area of 240,000 cm2. That’s loads of facial treatments to last way over 15 years of use. And don’t forget it’s also for treating your facial skin to give it a renewed glow. It’ll give years of use for this too so it’s a terrific value investment. The box is small, white and pink. There’s a lot of text because there’s also German, Italian, French and Spanish languages alongside the primary English copy. The packaging is ok, maybe a tad bland. 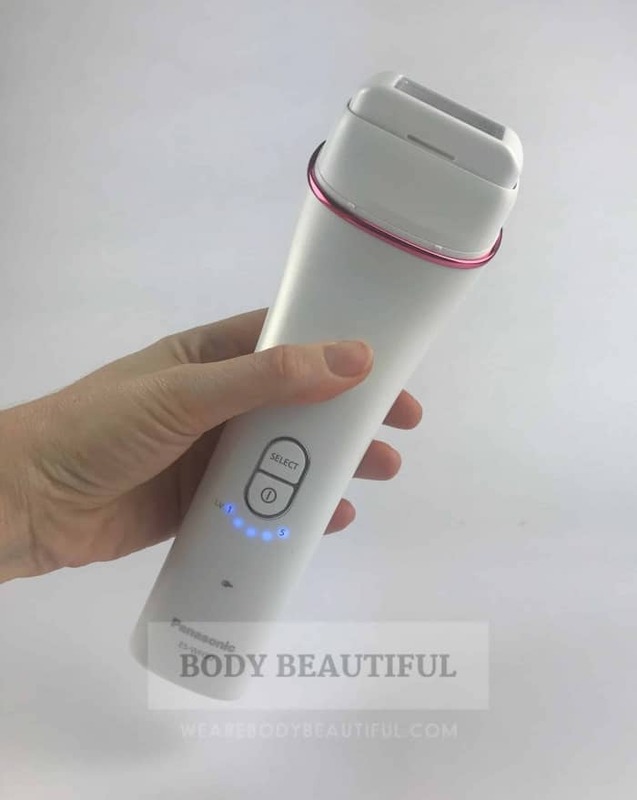 It doesn’t have the impact and attention to detail of Smoothskin, Philips, Tria or Silk’n. But it does the job and has most of the information you need. The box is small and attractive enough in white and magenta. It looks like a typical personal care electronic device box. 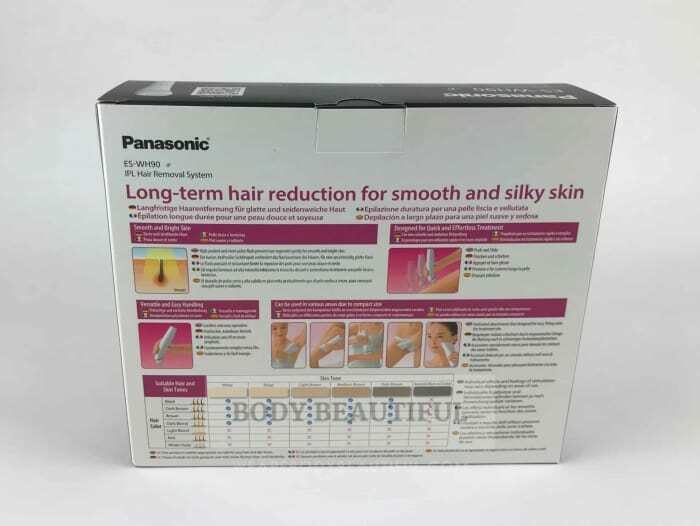 I like that Panasonic explain it’s for ‘long-term hair reduction’. The back of the box is printed in several European languages. 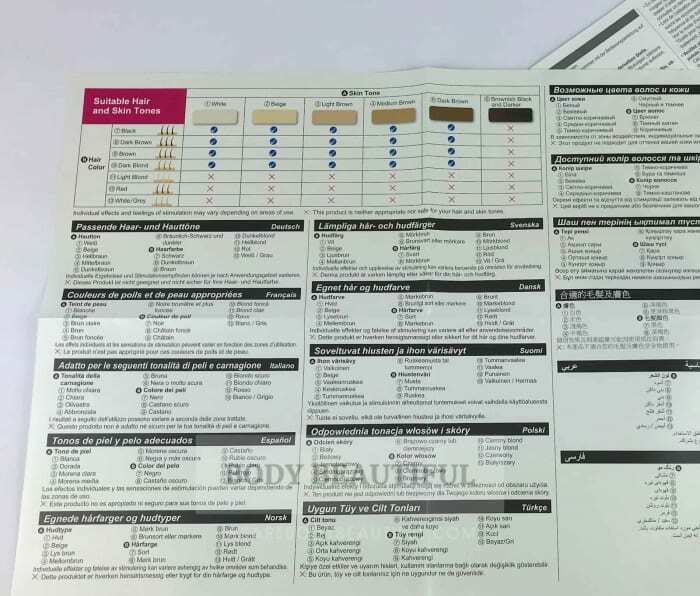 It shows the suitable skin tone and hair colour chart and areas you can use it on. There’s no clear explanation of the facial skin rejuvenation though. The contents slide out in protective cardboard compartments. It’s secure and compact, but hardly love at first sight. It’s dull, like opening an electric toothbrush or shaver. There’s nothing wrong with the packaging. It’s secure and everything’s in the right place. But other brands take more care to deliver a surprise with excitement and pleasure when you open the box. I think Panasonic could do a much better job. 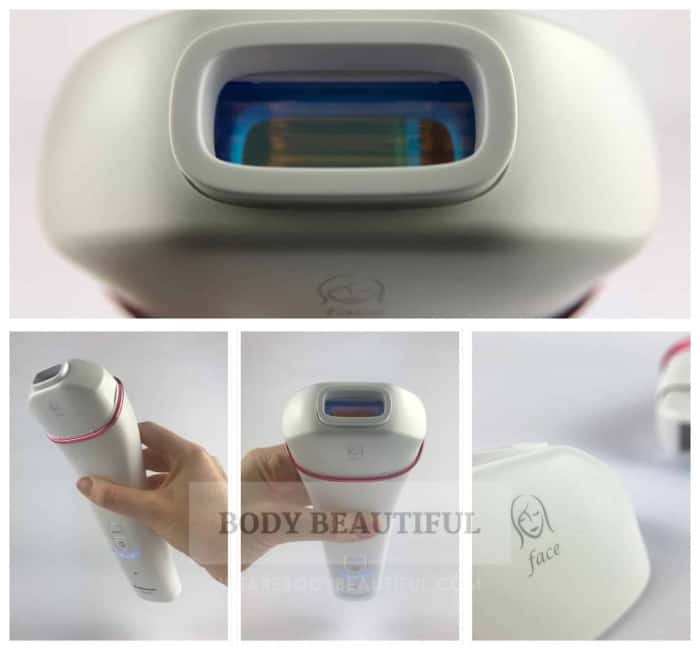 After all this device promises the life-changing dream of long-lasting silky-smooth skin. Let’s big it up a bit and get the senses tingling! 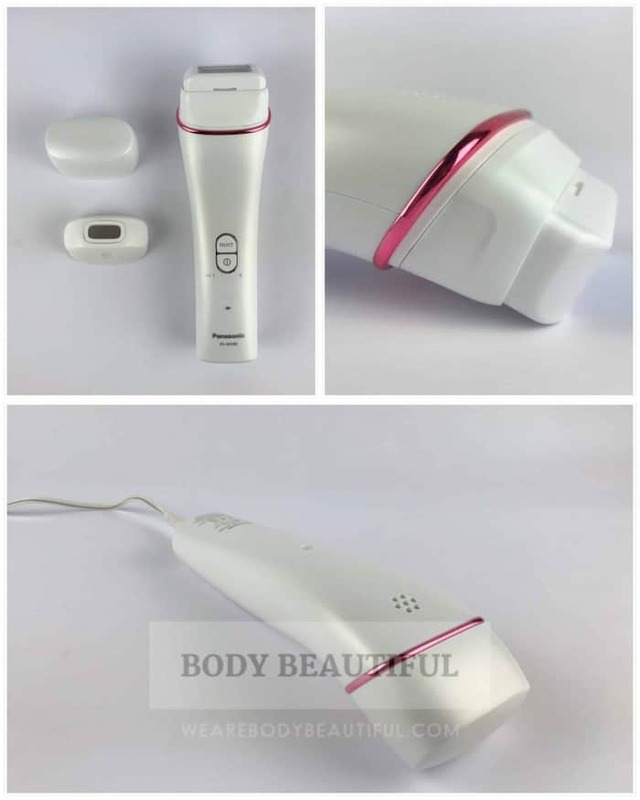 The box contents: ES-WH90 device with body attachment and protective cap, User manual, Facial attachment, UK power supply, Warranty card, Suitable hair and skin tone chart leaflet, Patch test and mandatories information leaflet. Or find out next what my first impressions were of the device. It’s a distinctive design, unlike all the others. The 21 cm long body is smooth and matt-white. It feels robust. It’s made of a high-quality plastic with a delicate shimmer. Down the sides are barely-visible seals that match the gentle, curvy shape. There’s a thin metallic-magenta trim running around the device. It forms a slight lip against which clips the matching shimmery-white protective cap. I like the way it reflects the light. There’s just 2 simple buttons to control the device. Take off the protective cap and underneath is the large 5.4 cm2 body attachment flash window. There’s also a smaller facial attachment marked with ‘face’ and an icon. There’s an interesting raised border around the flash opening. Learn what this is for later. The minimalist design, curves and blended angles are perhaps a bit bland on first sight, but don’t dismiss it. It deserves a further attention to really appreciate it. It’s heavier than expected because of the rechargeable battery inside. There are no creaks or cracks as I hold it in a few different grips. It’s solid and feels good to hold. The user manual starts with safety precautions and warnings. Read them to see if there’s any reason you shouldn’t use it. Then there’s a specification over view, helpful diagrams, treatment time guides by body area, how to use it guide, cleaning and troubleshooting Q&A section. It’s logical, helpful and makes sense. I was hoping for more on the ‘glow-enhancing’ science, but there’s not much shared in the user manual. The user instruction booklet is 145 pages long, but don’t worry! Only the first 24 pages are in English! There’s a section also in German, French, Italian, Spanish, Polish and Turkish. It’s easy to follow and comprehensive. I’d like to see more information about how the IPL skin rejuvenation works though. IPL and sun exposure don’t mix. The user manual warns you not to use the ES-WH90 on suntanned skin. But that’s where the advice ends. It doesn’t give any further helpful guidance. I’d suggest as with other brands, you should wait between 2 to 4 weeks after sunbathing before using it. You also shouldn’t expose treated skin to the sun for 2 weeks after treatment and apply SPF 30 sun protection for the duration of your treatment regimen. This is cautious but standard guidance to keep your skin healthy and safe. The user manual tells you to do a skin test and increase the intensity level one step at a time. It recommends testing a patch of skin on the lowest level (1), wait two days and if there’s no irritation to do a full treatment at that level. Then after two weeks for arms and legs or one week for bikini underarms and face, repeat the process at level 2. Then level 3 etc. Continue only if the flashes are comfortable. Start at level 1, flash the test skin patch, wait 2 days and if there’s no reaction do your full treatment area. Wait the suggested interval between sessions (2 weeks for legs and arms, 1 week for face, underarms and bikini line). Then repeat at level 2, then 3. Keep going only if the flashes are comfortable and there’s no reaction. I think a guide of suggested intensity levels by skin tone would be more helpful. This removes uncertainty and indecision around the safe levels for mid to darker skin tones. 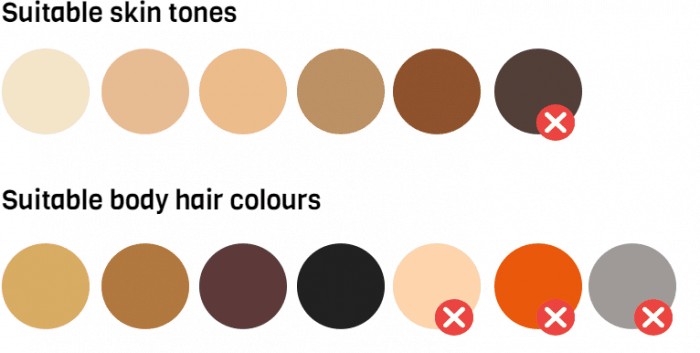 Also, if you have a lighter skin tone and you start on the lower levels it’ll take a bit longer to see results than if you started on the highest, safe level for your skin tone. Because my skin tone is fair to medium I decided to do a few patch tests at level 4 and 5 on my treatment area. I waited the suggested 2 days and was able to continue at level 5. But for maximum safety, follow the guide in the user manual. Next learn what I like about the shape and design. 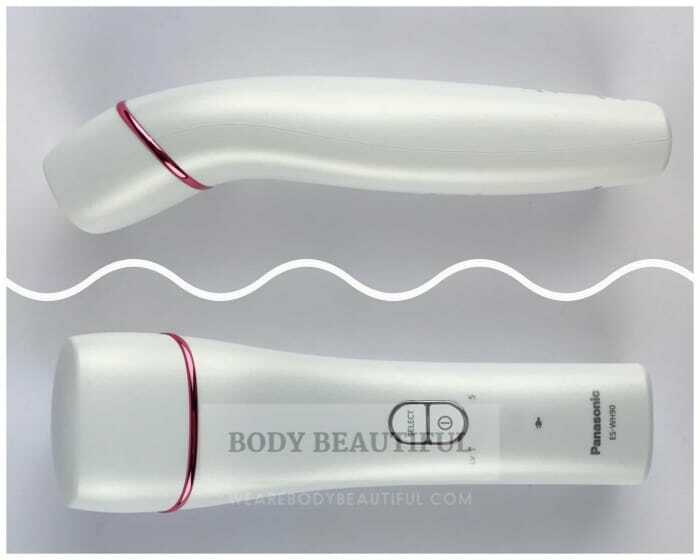 The Panasonic ES-WH90 is a distinctive, long wand-like shape. It’s battery powered, so there’s no cord to get in the way. It’s 21 cm in length, with a long slightly curvy handle that gives good grip. It’s narrower and thinner at the base (4.5 by 2.5 cm) and flares out and bends slighty forward towards the flash window where it’s 6 cm wide and 2 cm deep. The curves and angles are gentle, but I now appreciate a precise ergonomic design that feels great to hold. The curves and angles are subtle but precise. It’s a fantastic, minimalistic and ergonomic design. There’s a small circle of air vents at the top on the back. I like the protective cap to keep dust out of the flash window. It’s more stable if you lay it on its tummy with the protective cap on. It rocks a bit if laid on its back. The device weighs 360g. The weight adds to the durable, quality feel of the materials. The shape is comfortable to grip and easy to manoeuvre. And easier than most other devices to see where you’re placing it. That’s because the business end bends in slightly to create a visible angle. And the attachments taper-in and shape around the large flash window. There are 2 ways to grip it, depending on which body area you’re treating. The grip in the photo on the left is most comfortable with the body attachment when treating your legs. The grip on the right is best for your face. Alternate these grips for underarms, arms and bikini line. There’s no flash button or trigger. The 2 control buttons sit on the tummy at the widest part, just below and out the way where my hand naturally grips it. The mains cable is nothing pretty but it plugs securely into the base. The ES-WH90 is battery powered so you can use it cordless. The first charge takes 3 hours. From each full charge you get 600 flashes. According the user manual this is enough for a full body treatment (full legs, arms, underarms, bikini line and face). Charge it after each use so it’s ready to go next time. And take care of the battery. Remember to charge it periodically even if not in use (at least every 2 or 3 months) as this prolongs the life of the battery. 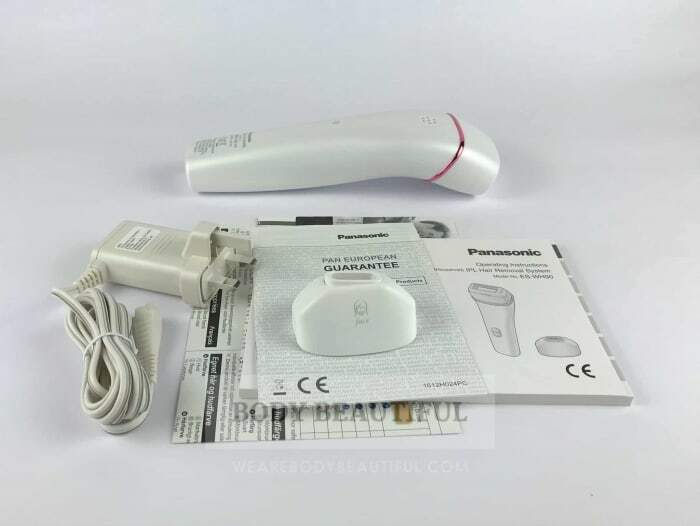 The Panasonic ES-WH90 works cordless. The power cable is therefore nothing special but it fits securely in the base and is long enough to reach a socket from a table. Lay it flat as it charges. The plug charging indicator light illuminates during the 3 hour charging cycle. 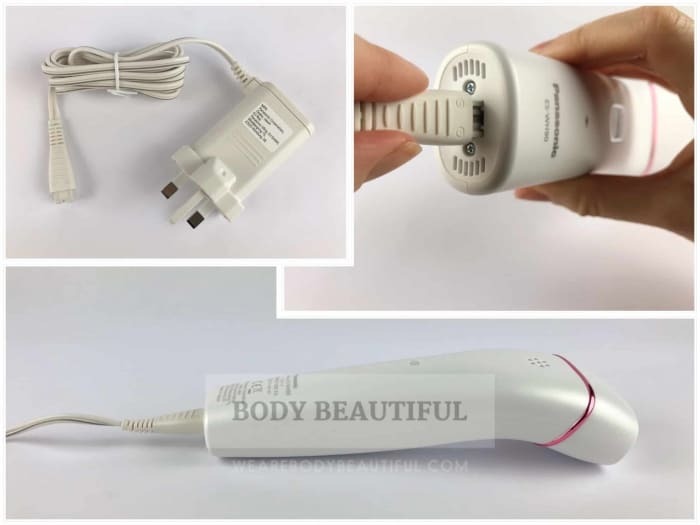 I like the cordless operation especially for facial treatments. You can shave or trim in the privacy of the bathroom and then treat your hairs looking in the bathroom mirror. No cables to worry about and nothing to plug in. The body attachment is 5.4 cm2 large and it fits perfectly over the top of the flash window below. A facial attachment at 2.4 cm2 small and it too fits over the top of the flash window below. Here, the Panasonic ES-WH90 device is without any attachments in place. The glass flash window is large and is fixed in place. The body and facial attachment slide on over the top and clip in place. On the left, the smaller facial attachment is placed over the top of the flash window. On the right the larger body attachment is in place. The attachments also control the flashes, seen as there’s no flash button to press with your finger. As you press it against your skin, the attachments move down just a few millimetres. This acts as a switch and emits a flash. No other device works this way. I think it’s clever and very intuitive. Panasonic built the equivalent of a flash button into each of the flash attachments. The section of the body attachement next to the magenta trim is fixed. The section below that moves on a little spring-like system. When attached it sits about 5 mm above the flash window beneath. Pressing it against your skin makes the spring-like mechanism push in a few millimetres and activates the flashes. Lift it from your skin and the springs release again, and the flashes stop. 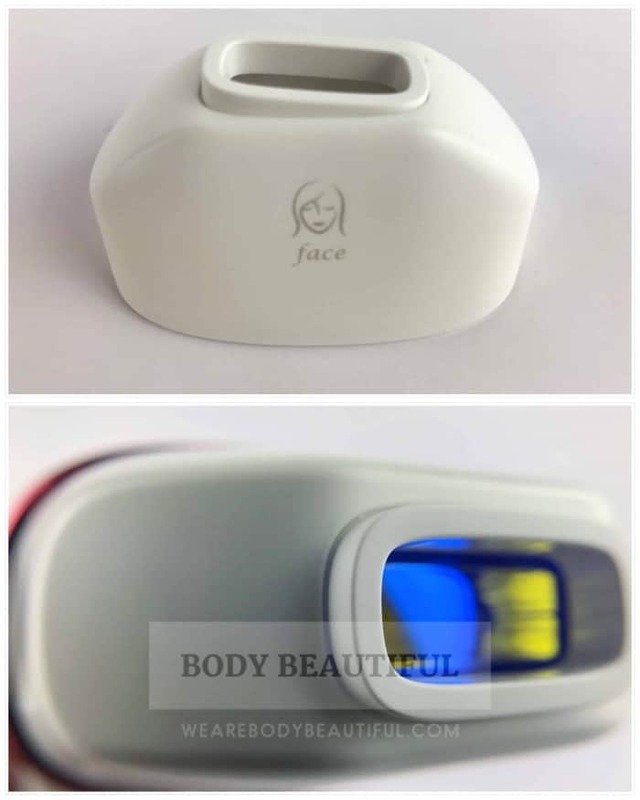 The facial attachment uses a similar mechanism to control the flashes, except the small lip you see around the flash opening is the spring-like mechanism. It’s particularly good on the face because you can clearly see where the flash window is for precise positioning and coverage. But is it safe for your eyes? Other devices rely on a skin sensor around the flash window to prevent accidental flashes into open air. But the ES-WH90 doesn’t have one. So, is it unsafe? No, it just has a different flash mechanism compared to other devices. And because it’s not finger activated it’s very hard to accidentally flash it as you handle it. There’s no flash button to accidentally press with your fingers as you handle the Panasonic ES-WH90. Therefore, it’s more difficult to unintentionally flash it, especially into space near your eyes. It’s unlikely to harm your eyes because the entire attachment must be pressed down before it’ll flash. And for this to happen something must cover all the flash window. So the flash can’t escape and harm your eyes. The unique design of the flash attachments means it’s very hard to accidentally flash the device into open air. That’s because there’s no flash button to accidentally press with your fingers as you handle it. In addition, the flash switch in the body and face attachment must be entirely depressed before it’ll flash i.e. something must be pressing down equally on all sides of the attachment. If this happens by accident, there’s probably something covering the entire flash window, therefore it can’t flash into open air. N.B., I think this is safe to protect against unintentional flashes. But note, this does mean you can press the attachments with your fingers and make them flash. But, that’s kind of intentional, so really. Why? Just don’t do that. The Panasonic ES-WH90 has 5 intensity levels. It defaults to Level 1 when turning on the device. Press the ‘select’ button to cycle up through the levels. You get faster results using the safest, highest intensity level for your skin tone. 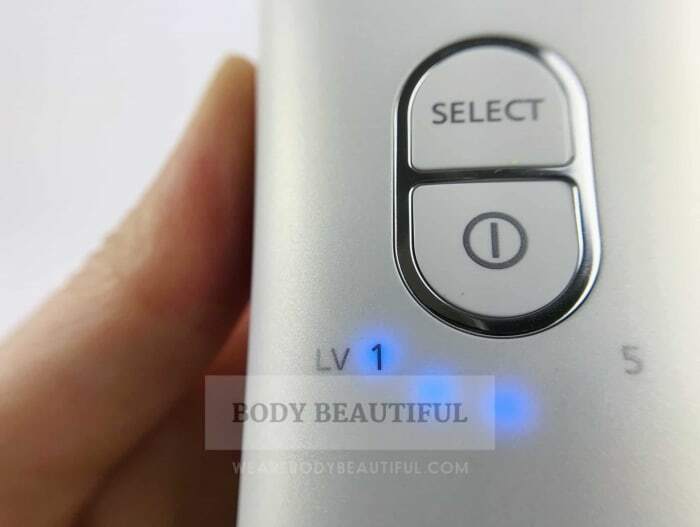 When you power on the Panasonic ES-wh90, the level one blue indicator light flashes then illuminates continuously after a beep. Press the ‘Select’ button to cycle up through the levels to level 5, you hear a beep as you select each then back to level 1 again. The second beep and constant blue indicators mean the device is ready to flash. The ES-WH90 doesn’t have a skin tone sensor. If like me, you have a lighter skin tone you shouldn’t let this put you off. Because most of the intensity levels will be safe for your skin tone. Just test them with a test patch and choose the most comfortable. If your skin tone is medium to dark you can also follow this advice by just testing the lower intensity levels. But if you have a darker complexion you can choose a similar priced device that’s safe for all skin tones, even the darkest. This alternative activates only the levels safe for your skin tone too. The Panasonic ES-WH90 is safe for light to dark skin tones, but it has no skin tone sensor. This isn’t a problem if you have a lighter skin tone. But if you have dark skin you may want to try an alternative that’s safe for all skin tones and activates only the levels safe for your skin tone. There’s two ways you can use the ES-WH90. Press the device against your skin until it flashes then lift it, move it to the next area and repeat. This is for a single flash. I prefer to use it this way on my face and bikini line to be sure I get precise coverage. For continuous flashes, after the first flash slide the device over your skin to the next spot while keeping it pressed against your skin. The flashes come every 2 to 3 seconds. They’re quicker on the lower intensity levels. After about 10 flashes you need to lift it from your skin and repeat. I use continuous flashes on the flatter parts of my legs and my underarms. Next, learn how fast it is! It flashes every 2 to 3 seconds. The flashes are fastest on the lower intensity levels. The flash repetition rate is average, but it’s still one of the fastest for large areas because that’s combined with the very large 5.4 cm2 body attachment. You can cover a pair of underarms (roughly 120 cm2) in 44 seconds to 1:07 mins. That’s fast! Panasonic say you can cover a full leg in around 10 minutes. That’s about right, give or take a minute or 2 and depending on how thorough you are. So, it gives fast treatments when using the body attachment. It’s one of the fastest. And the in-built flash switch mechanism means it’s very easy to get good contact on most body areas. On your face you must use the facial attachment, and it takes just a few minutes to treat your upper lip, neck and chin. The raised lip design means it’s easy to get good contact and coverage. It’s a top choice for fast full body treatments and facial use. The website does a decent job of explaining the key features and you can download the user manual. But I found some information gaps when compared to other brands. They don’t tell the IPL energy level of the device, and it’s not said if the device is clinically proven. I’d also like to see a better explanation of how IPL works for an enhanced facial glow. The website references a study of 32 subjects but is not available to read. They don’t share the exact results, just a meaningless bar chart diagram implying skin was brighter after 8 weeks of use. Meh. So, I contacted Panasonic Customer support to fill in the gaps. I received prompt responses via online chat and slightly slower responses to my email queries. It takes a few days to get responses to some of my questions, but they did eventually come back. You get a 2-year warranty. But unfortunately, Panasonic don’t offer a money back guarantee. What’s the feedback from the online reviews? There’s a good amount of positive feedback for the Panasonic ES-WH90. 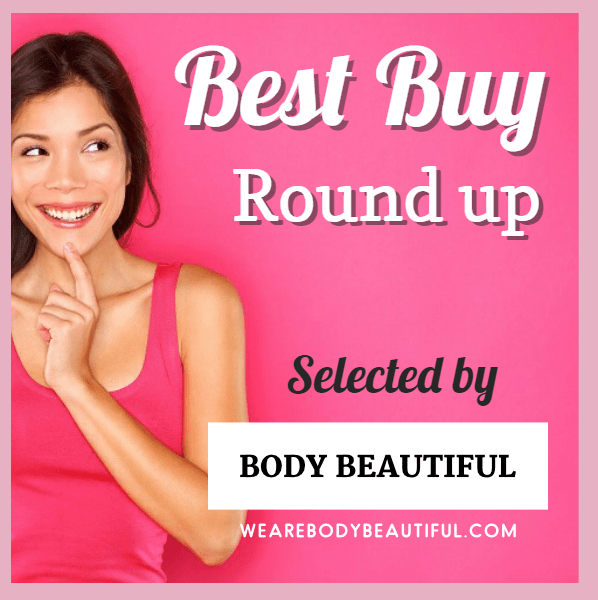 As of November2018 there are 140 online reviews from Boots.com and Amazon. The average score from the collated online Panasonic ES-WH90 reviews is a strong 4.4 stars. Or read this quick recap of the pros and cons in this Panasonic ES-WH90 review. Yes. It’s a fantastic value device you can buy for under £200. 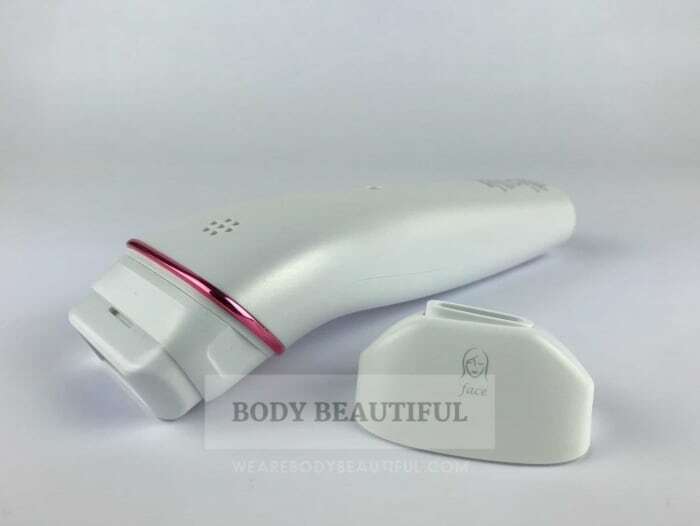 It scores highly against all the criteria and it’s my Best IPL hair removal device for facial use & radiant skin rejuvenation. The lamp lifetime is great, treatment times are fast and with a solid, top quality build. It’s cordless and very comfortable to use too. I especially like it for facial use. That’s because the cordless, long wand-like-shape is easy to manoeuvre and see where you’re placing it. And I love the clever flash activation in the attachments. The facial attachment has a raised lip ringing the flash area so it’s easy to see where you’re positioning it. Getting good skin contact is easy too, so you won’t spend ages trying to get it to flash on your upper lip. I recommend the Panasonic ES-WH90 for full body, small areas and facial use. But I particularly love it for facial use, and because it doubles as a skin rejuvenation beauty tool for your face to make our skin glow. Bonus. It also doubles as an IPL skin rejuvenation tool. Use it every 3 days for two months to even and brighten your skin tone for more radiant skin. I love this added benefit to give a smooth AND glowing face. For these dual benefits I think it’s a great gift idea for under £200. 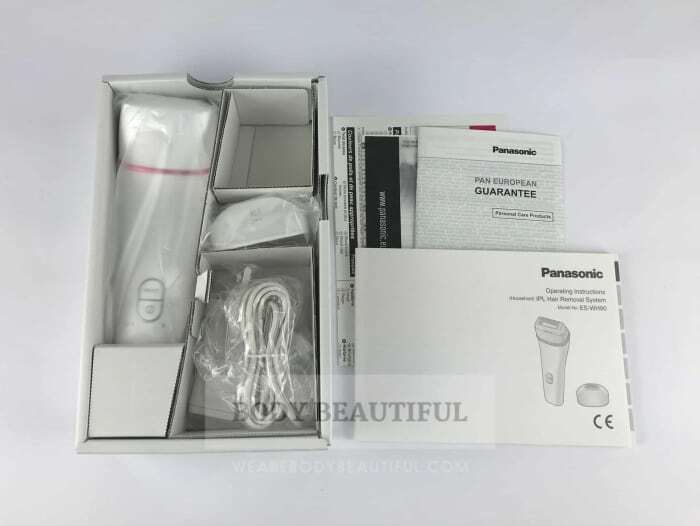 You can check prices and buy the Panasonic ES-WH90 using the links below.